Icon of Nieu-Bethesda – the Owlhouse. For many decades, the little village of Nieu-Bethesda in the Sneeuberg Mountains was a dead-quiet place where very little happened. The spring-fed water furrows (leiwater) gurgled through Nieu-Bethesda, there were lots of donkey carts and survival was hard for most of the villagers. Then playwright Athol Fugard wrote The Road to Mecca and Nieu-Bethesda hit the national scene. Fugard’s play swung a spotlight on the life of one Helen Martins and the Owlhouse she lived in. In the years that followed, the Owlhouse became a strong Karoo icon. You ventured down these valleys to the village, took a walk around the Owlhouse and the Camel Yard, heard about Auntie Helen and spent the rest of the time savouring the fresh air and delicious water. The Owlhouse is still a strong attraction. 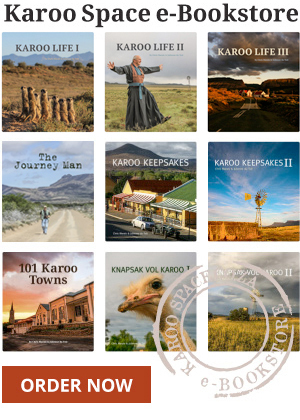 But, added to that, is the Outsiders backpackers and self-cater group of typical Karoo houses, a great cheese & brewery venue, a township eatery and a restaurant that often presents live music. Big-name singers and players from all over the country love to perform in Nieu-Bethesda, even though the audience seldom numbers more than 50 souls. Out at Ganora Guest Farm, the Steynberg family run a guest house, a farm museum and a meerkat rehab centre as well as doing normal farm work. 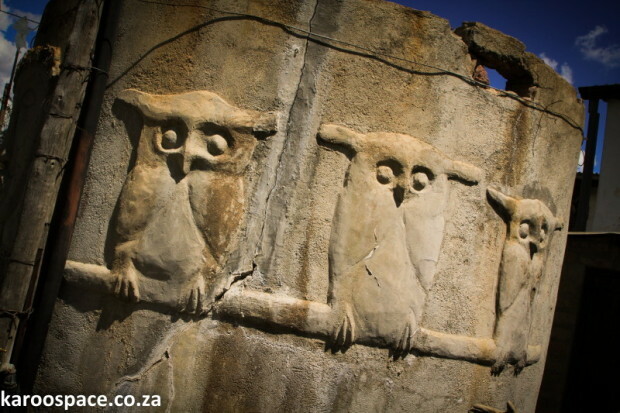 JP Steynberg takes you out on fossil tours and then, when you visit the Kitching Fossil and Exploration Centre in Nieu-Bethesda, the ‘stone bones’ make complete sense to you. 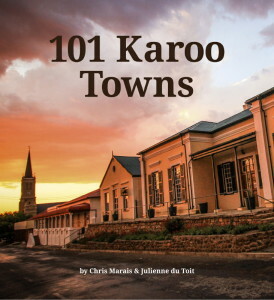 Check out our newly-released e-Book, 101 Karoo Towns, HERE.